The Cambridge Crew of 1875 in training on the Cam. I do not know who the oldest living Oxford–Cambridge Boat Race veteran is, but I doubt that there is any Light or Dark Blue surviving today who raced before the 1939-1945 War. However, most of those Old Blues who have passed on since the first race in 1829 are immortalised in some way, the majority in visual images of some kind. The earliest live on in illustrations, later ones in sepia, monochrome and then colour photographs. 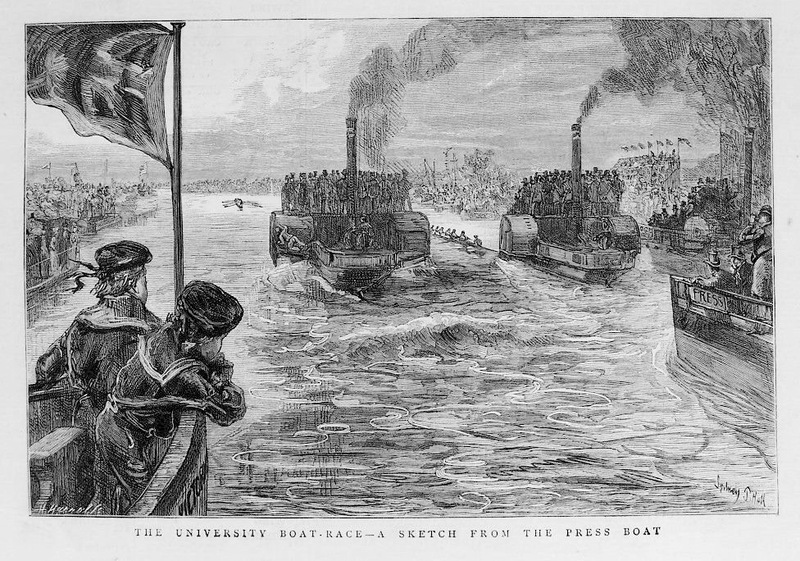 The first moving pictures of an Oxford–Cambridge Boat Race were taken in black and white in 1895 (indeed, this is regarded as the first ever commercial British film). Years after, colour film caught the action and, later still, the job was done by video tape. Most recently, both moving and still images have been in the digital domain. So much for sight, but what of sound? The four ages of audio recording can be classed as mechanical (1877-1925), electrical (1925-1945), magnetic (1945-1975), and digital (1975-present). I recently acquired three remarkable interviews with Boat Race veterans recorded in the 1930s and 1940s. They were with GC Dicker, who rowed for Cambridge in 1875, FI Pitman, who was in the Light Blue crew in 1886, and RC Bourne, who stroked Oxford in 1912. I have made these into separate YouTube videos, adding pictures to the soundtracks. The film featuring Gerald Dicker, interviewed two years before his death in 1951, can be viewed below. First though, a little background. 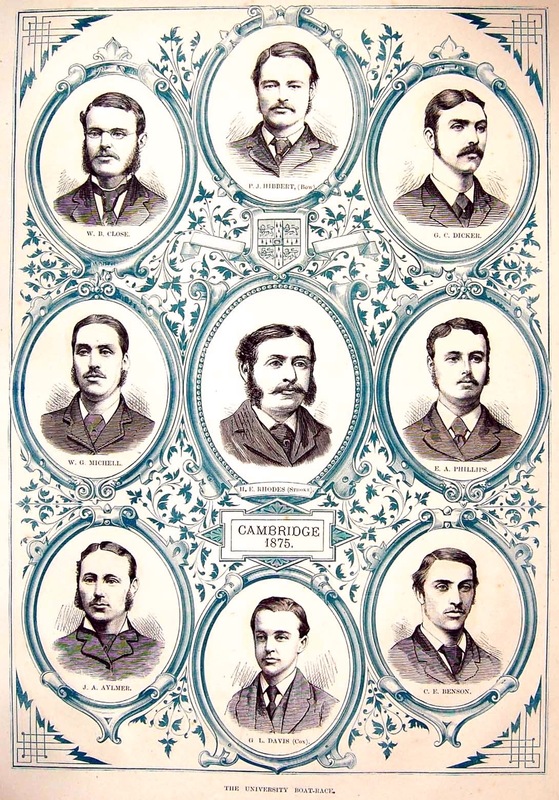 The Cambridge Crew of 1875. GC Dicker, who rowed at ‘3’, is at the top right. 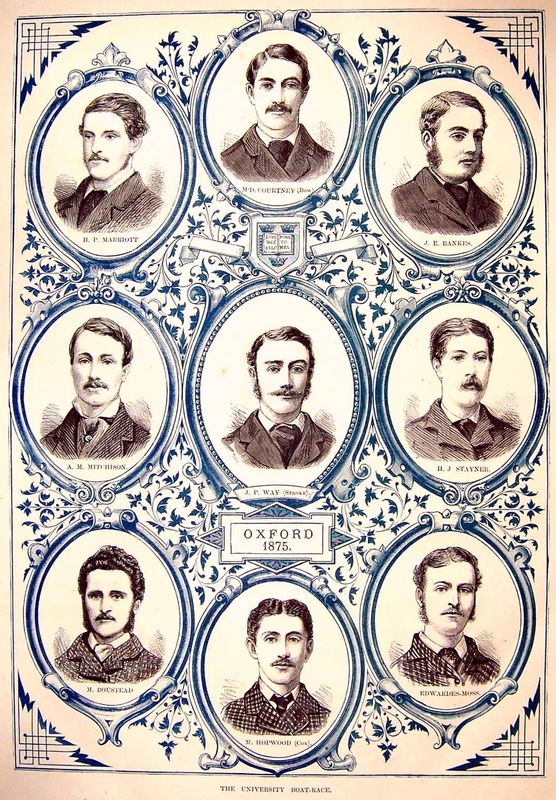 The Oxford Crew of 1875. Gerald Campbell Dicker was born in London in 1853. He attended Winchester School and went up to Trinity College, Cambridge, in 1871. 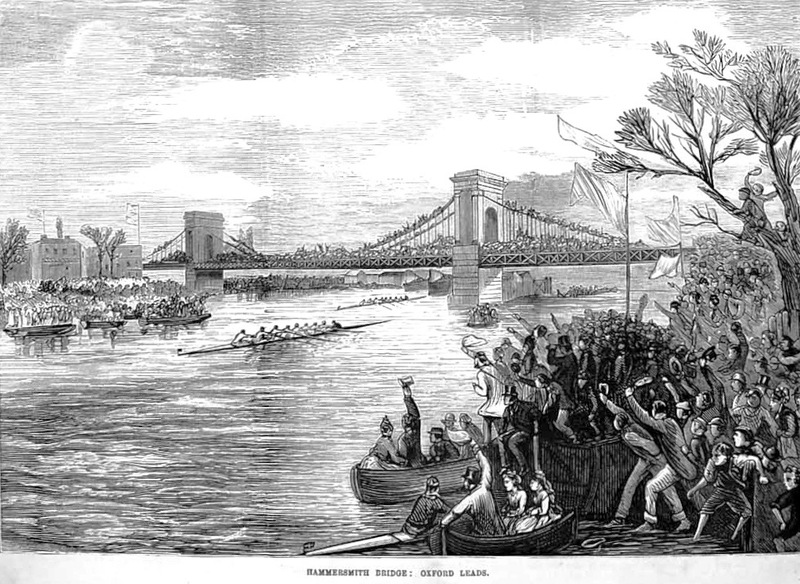 He spent eight years there but rowed for CUBC only once, in 1875. 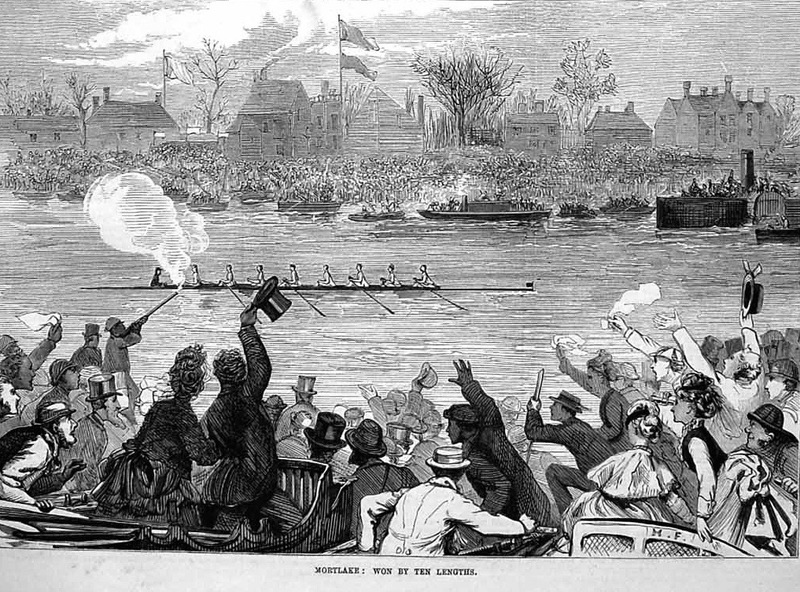 However, he did win the Ladies’ Plate with First Trinity Boat Club at Henley in 1874. 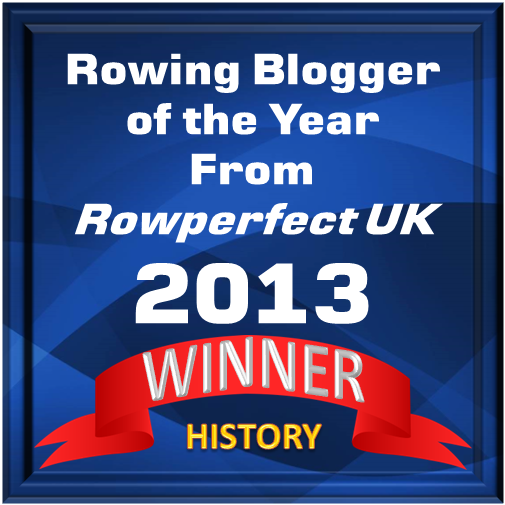 Other notable achievements on the water included winning the University Pairs and going Head of the River. He was ordained a priest in 1879 and over the next 52 years had parishes in Liverpool and Cheshire. His brother, Alfred Cecil Dicker, was also a priest and an oarsman. Alfred won Cambridge University’s Colquhoun Sculls (1873), Henley’s Diamond Sculls (1873, 1874 and 1875) and the Winfield Sculls, the English Amateur Championship, (1873 and 1874). 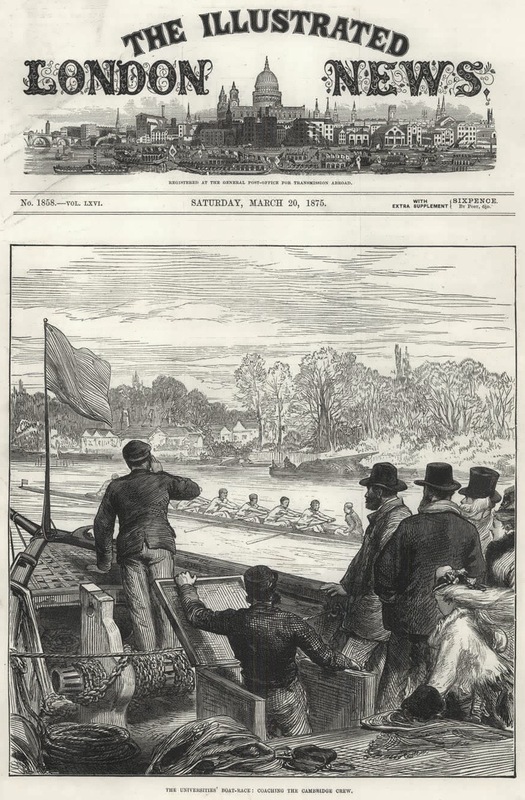 The Illustrated London News, 20 March 1875: Coaching the Cambridge Crew. There had been a nasty north-west wind beating up against a fair tide when the race started. Cambridge, who had won the toss and taken the Middlesex side, went off at a very high rate, had gained half a length in the first minute, and soon after were nearly clear. Oxford, not expecting to be slipped at the start, nearly went to pieces. (The Oxford stroke) however, was not to be hustled, and steadying his men out, he soon got them together again. 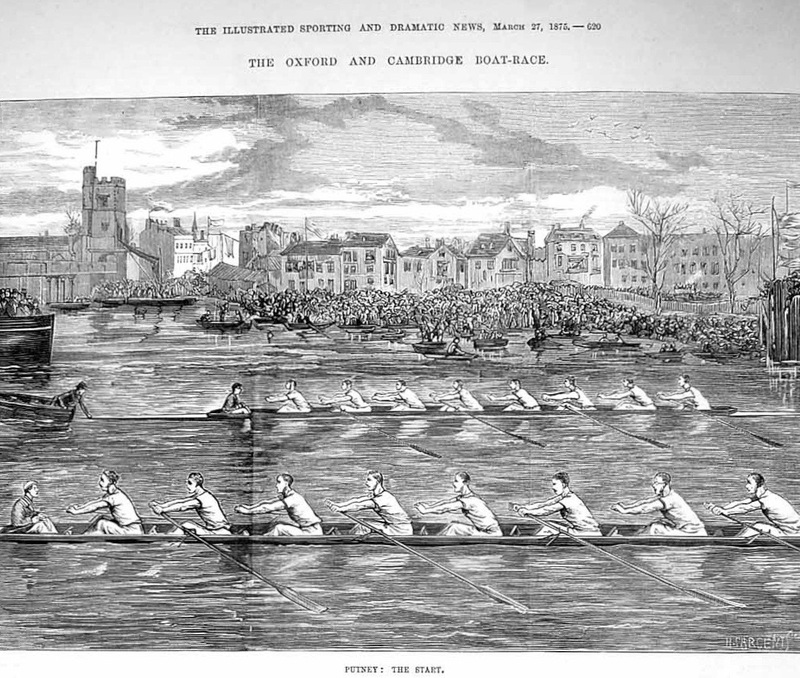 Cambridge could not keep up their fast stroke against the head wind, and from the Craven Cottage began to drop back. At the Crab Tree the crews were level and at Hammersmith, with the station to help them, Oxford were clear and the race was over. 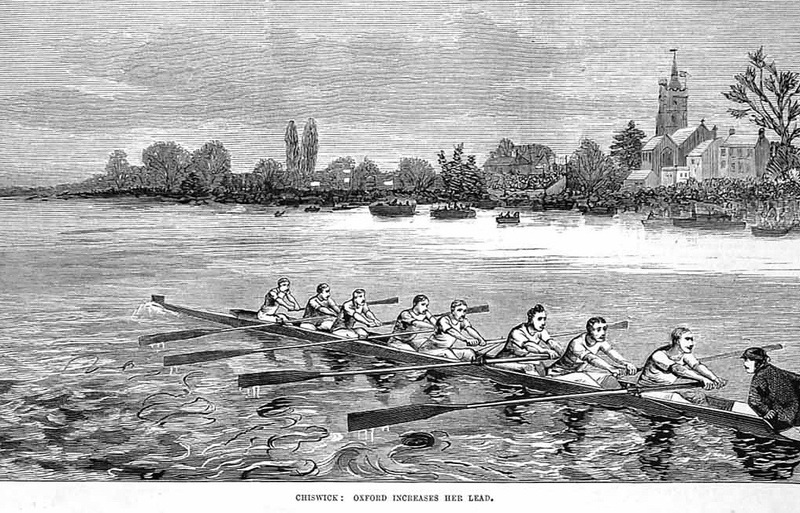 Chiswick: Oxford increase their lead. Oxford, beautifully together, went right away to win by 10 lengths in 22 min 2 sec. Mortlake: Won by ten lengths. Listening to Dicker’s account of the race, there is one very important detail that the Centenary History (and also the much longer and more detailed account in The Times of 22 March 1875) did not record. Dicker says that around Harrods Repository (which would then have been the Soap Works), rough water resulted in his sliding seat breaking and him being stabbed in the back by the resulting broken timber, the consequence being that Oxford took the lead. However, the account in The Times simply noted that when the Cambridge boat was approaching the Crabtree, the stroke-side oars (were) rowing the bow-side oars round … Consequently, Oxford drew up alongside Cambridge…. and at once commenced to lead in their turn. Seventy-four years on, Dicker probably misremembered where the lead changed hands but we can assume that his reconciliation of a broken seat was accurate. Sitting at ‘3’, he stopped rowing effectively and the Cambridge bow side was a man down. I think that the failure of this fact to be properly recorded tells us two important things about press reporting at the time. 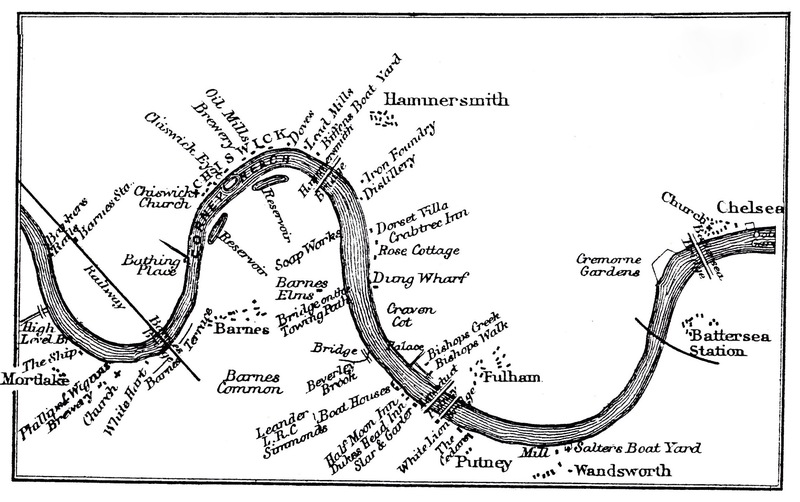 The Championship Course in 1870. Nowadays, Dung Wharf houses luxury flats and a name change. Firstly, the big, unwieldy steamers that followed the race, carrying the umpire, reporters, Old Blues and spectators, may have been a long way back from the action, perhaps with views obscured by funnel smoke, other boats, and by the tightly packed mass of fellow passengers (the large craft should have kept back in any case, lest they caused ‘draw down’, affecting the small rowing boats). Secondly, the press did not talk to the crews afterwards. This was partly because this was not the style of reporting practiced at the time (something that lasted into the modern age) and partly because the crews went ashore easily at the finish, but the big steamers had to disembark their passengers at a pier or wharf. Also, the correspondents were in a rush, they had to handwrite their copy and physically get the resulting paperwork to the newspaper offices and printing presses in Central London. 1878: The view from the press boat is somewhat distant and obscured. 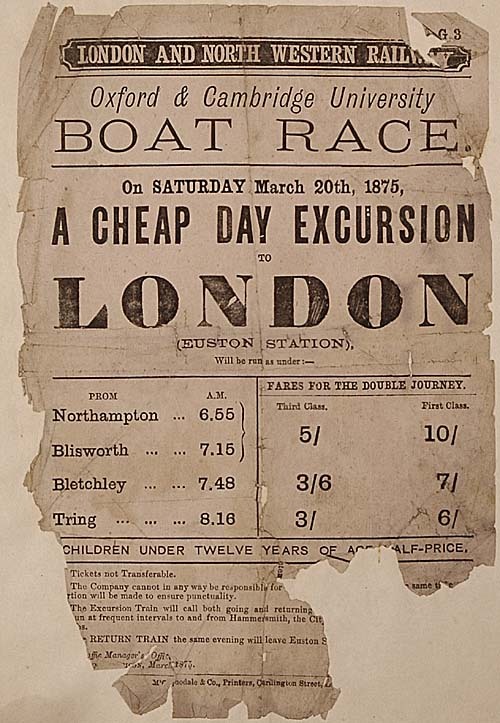 Proof of how popular the Boat Race was by 1875: a poster advertising a special train to London from Northampton, a distance of eighty miles. 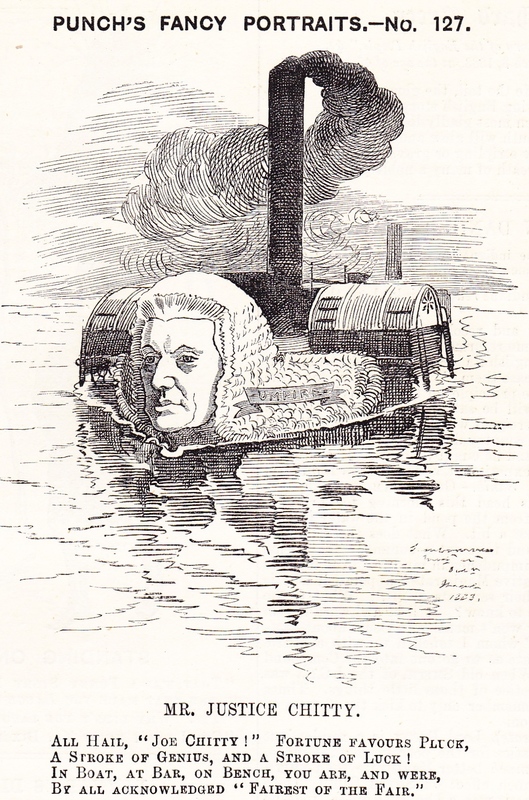 Mr Justice Chitty was the race umpire. Ultimately however, the most remarkable thing about the recording of Mr Dicker’s memories is not anything that he said, but the fact that we can actually listen to the voice of a man who was born in 1853 and who was a participant in the 1875 Boat Race. Next Contenders On The Waterfront: Pictures From Tideway Week, Part I.